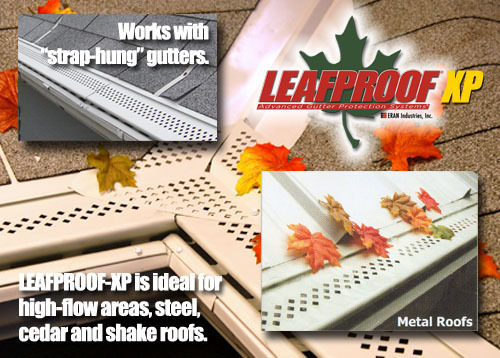 Leafproof® is a solid aluminum gutter cover that installs over existing gutters without penetrating your roof. The patented “S-Bend” slows the flow of rainwater, causing the water to adhere to the Leafproof® panel. The Leafproof® System can be installed on any type of roofing, including shingles, slate, metal and tile, and on any roof pitch. Leafproof®- XP is ideal where extreme protection is needed. XP was designed to handle rainwater in high flow areas like metal, slate and tile roofs; as well as roof valleys. The small, diamond vents allow rainwater to flow into the gutters while keeping leaves and debris out. 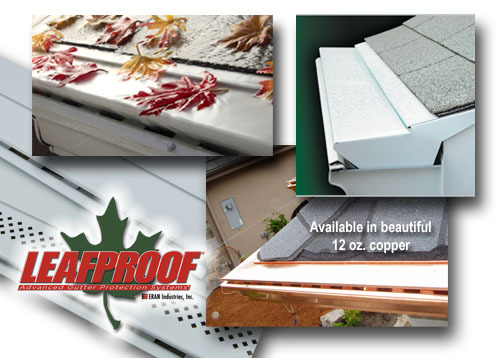 The Heated Leafproof® System is available for homes in northern climates. 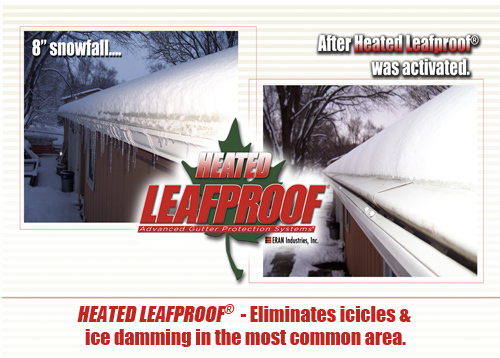 The system keeps leaves and debris out of your gutters AND completely eliminates icicle and ice dam formation.